Custom Banner for your Loved one's or Special Events. Print Custom Farewell Banner, Welcome Back Banner, Proposal Banner or 21st Birthday Banner for your Loved one’s or Special Events. Just add texts and photo to this amazing banner and you are ready to celebrate ! There was a time when birthdays were all about balloons and cakes only. You get this day as a chance to express your appreciation of the person. They are the ideal way to announce to the world that someone special came into your life on this special day. If you do a banner for your event, you can decorate your party . You can add special slogans and short personal messages for your banner. For example, a quote like “At Forty Life Is Just Beginning” can cheer someone up. Otherwise, “Forever Young at 70” or “Sweet Sixteen at 60” are also very exciting short birthday messages. The options are limitless! You can make your friends, family members; parents, kids and spouse feel special by arranging a birthday banner to surprise them. 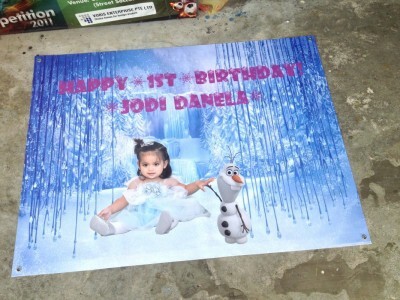 When he/she grows up the banner or photo will be a proof of how special their birthday or event was, great memories. We have large collections of banner designs, if you still can’t find the design on your mind, just email us your request. We are good on graphic design.